When it comes to fishing, it’s usually the little things that you do that can make such a big difference. This is especially true when it comes to ice fishing. When fishing a body of water such as Lake Winnebago, most of the time you are fishing expansive mud flats. The fish here are not really relating to structure (such as reefs and trees) as you know it. What they are doing is relating to worm beds, ice heaves, and snow drifts. Ice heaves and snow drifts, when the water is crystal clear as it was last season, provide dark areas which normally causes the water to be cloudier. This will hold different types of bait fish like shad, shiners, and trout perch. Where the bait fish are, the walleye, crappies, and white bass will be nearby. 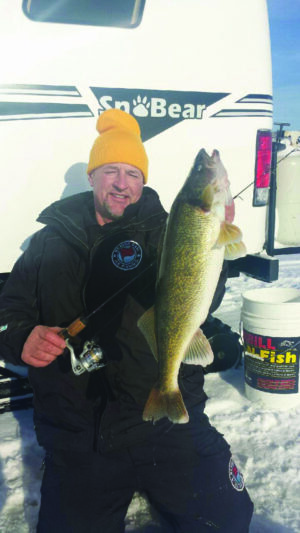 When you are fishing the largest inland lake in the state, which at its widest point is 11-1/2 miles wide and about 28 miles long, there is a lot of water to choose from and knowing this will help to narrow the search. It also seems that when fishermen come out on a large body of water like this, the first structure they look for are usually Chevys, Fords and Dodges, rather than the structure that I have alluded to previously. Because of this, they are missing out on a lot of golden opportunities to locate fish on their own. Another point to remember when fishing an expansive body of water like Lake Winnebago is that the water clarity most often is very clear. This has occurred mainly due to the presence of zebra mussels that have changed this body of water from a stained system to one that is very clear. Years ago when the water was stained, most of the fish in the winter related to the bottom. You would fish a foot and a half at the most off the bottom with your tip-ups and jigs in the same water column. Now, with the water being clear and the forage being more shad based, these fish can be anywhere in the water column. So changing your techniques as far as where you are jigging can make or break your fishing success. This is why your flasher unit can be one of the most important tools to bring with you on the ice. I like to use my Humminbird Ice 55 unit, but I also feel that Vexilars are great units as well. I have some Vexilars that are over 25 years old and I haven’t had a single problem with them. This is amazing considering the amount of use they get. The Humminbird does have some unique features which I lean on to increase my success. There are two important reasons for having this tool. One is that they show you where the fish are in the water column. Always try to stay above the fish when you see them. Never drop the bait right to them. 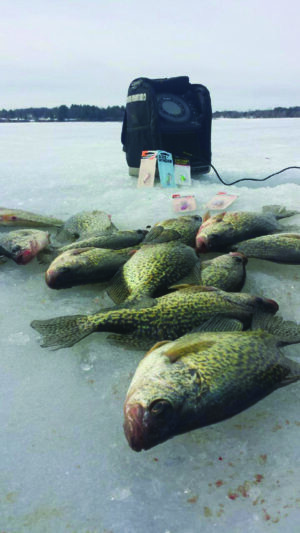 This is one of the biggest mistakes ice fisherman make when fishing clear water. Think about this; how unnatural would it be for a bait fish to swim right down into the school of game fish? A lot of time this will spook the fish that you are trying to target. Always stay above them and make them come to you. 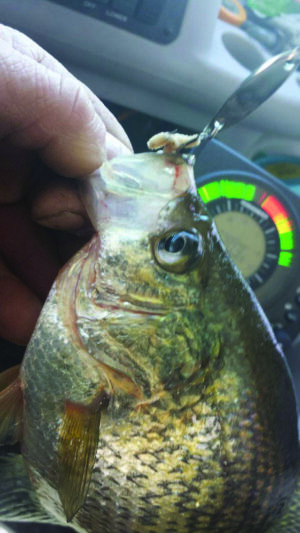 Second, a flasher shows you how the fish are reacting to what you are putting down there as far as the type of bait and how you are presenting it. For instance, if the fish keep swimming away, then you need to change your jigging style or possibly change the color. I personally think that spoons are easier in teaching people how to get the jigging technique down and can be more effective for them as a result. I prefer spoons like Kastmasters. These are one of my favorite spoons. They have a very unique action to them, which no other spoons imitate. Jigging Rapalas are also very deadly on this body of water. However, using any type of jigging Rapala requires a little bit more technique and experience to be very productive. One of the keys when using a jigging Rapala is to make sure that the nose of the Rapala is pointed down. An easy way to accomplish this is to tie a Palomar knot around the entire body. Something else that you can do that works with a jigging Rapala is to cut the back plastic fin off which keeps the Rapala from darting from side to side. It seems like during very cold weather, like we had last year when the water temperature dropped so low and the fish got more temperamental, that the fish will react better to this. Another factor to consider when ice fishing is noise level. Last year, because the water was so clear, we had to keep our own guide shacks at least 100 to 200 hundred yards apart from one another. If we put them any closer than that, we would spook the school we were working. This leads to a story. Last year, we had our shacks at least a 100-200 yards apart from one another. There was a National Ice Fishing tournament going on in which the participants could only be on snowmobiles or four wheelers. I looked over by one of the shacks and two of the guys had pulled up on a four-wheeler. For about 20 minutes, they had two drills going constantly. They must have drilled about 50 holes and the holes were only about ten feet apart. I pulled up to one of the guys with my Suburban as he was drilling. He didn’t notice me at first. When he stopped drilling, he looked up and saw me about five feet from him. I asked him very nicely, because I was curious, and because he was a tournament fisherman, I thought he would have had a reason to drill all these holes so close together and I wanted to know what he knew that I didn’t. I asked him if he knew that this water was crystal clear. He said he did. I also asked him if he knew that there was no structure in this area. These fish can see a bait at least a 100 to 150 yards and that they spook very easily. Again, he said that he did. The last thing I said to him was: Do you know that shanty over there that was catching fish is no longer catching fish? The school was gone. He didn’t say a thing, just turned around, grabbed an ice rod and started fishing. I drove over to my shanty, hooked up and started pulling it away. As I was doing this, they grabbed all their gear and left. I know that out of the 50 holes that they drilled they had only fished two or three. The moral of the story is: When fishing a body of water that does not have a lot of structure, has very clear water, and the fact that the fish can see your lure 100-150 yards away, there is no sense in drilling that many holes that closely together. The key is to get the right techniques down and get the fish to come to you. When it comes to anything in life, I feel trying to educate yourself is one of the most important techniques. For me, when it comes to fishing, one of the things I love about it the most is that I am always learning. I would also say, (from a guy that spends over 300 days a year on the water), 99 percent of the people that enjoy the outdoors are very good people and that I am very fortunate to be able to be in the outdoor environment almost every day. I also think that it is very important to get more kids and women involved in the outdoors. So, next time you head out, be sure to take someone along.